Muhammad Ali was one of boxing’s greatest footwork skill-sets ever on display. “Float like a butterfly and sting like a bee” was the mantra of boxing’s self-proclaimed “The Greatest”. And float he did. The legendary Ali bounced, shuffled, jumped, dashed, slid, pivoted, cut, and ran his way into the boxing hall-of-fame with his graceful footwork. Very few could move as effortlessly and poetically as he did. But Ali’s footwork was more than just aesthetic flash, there was also substance. Beyond the flowing grace and elegance of his movements, with the incredible balance, power, speed, and stability. Imagine the power of a battleship combined with the precision of a figure-skater. It was indeed repeated again and again that his footwork was the best in history. What does it take to develop Ali’s amazing footwork? How were his footwork techniques different from everyone else? And more importantly, how does changing the way you look at footwork change your fighting technique overall? It goes without saying that Muhammad Ali’s boxing footwork was quite different from the average boxer. He was a one-of-a-kind, but he also wasn’t the only one to move that way and certainly not the only one to have that ability. I’ve seen many other fighters move that way, too…even at the amateur level. I myself had a lot of natural footwork ability but it wasn’t until I had some ballet training that I was able to understand how I did it and to be able to teach others how to do it. This is the first and foremost distinction in differentiating Ali’s footwork technique from most boxers. The typical boxer will bend his knees more (and in my opinion, have TOO MUCH knee bending) whereas Muhammad Ali has relatively straight legs. The difference, and sometimes very small difference, in these positions impacts greatly on the way you stand and move. In short, your body moves far more effectively and efficiently with straighter legs. The body is simply built this way and it is the way that your body was made to hold itself and to move itself. Let’s do some anatomical analysis. Think of the times when you’ve stood around waiting for the bus. Generally, you stood on relatively straight legs, right? Sure you relaxed your knees rather than locking them but you didn’t stand with bent knees. If you’ve ever done any physical exercise or martial arts poses where the knees are bent, you will remember that it’s very difficult to stand for an extended period of time with the knees bent. It’s not only incredibly tiring but it’s also hard to walk around casually when your knees are bent. The reason it’s tiring for you is because you’re using muscles to hold yourself up rather than your bones. Never forget that your bones are exponentially stronger when they are straight. You can either find a way to relax on a straight bone, or otherwise blow a lot of energy to try and duplicate the same strength and stability using muscle. It’s your choice. move more efficiently than bent legs. Is it really that simple? Should we all be using our bones rather than our muscles? If you want to be more powerful and energy-efficient, YES. Use your bones and joints to transfer and deliver strength. Muscles are to help you move, bones deliver that strength and solid stability. If you use muscle to do what your bones should have done, you will be less athletic overall. Too many athletes place themselves into positions where they use their muscle because it FEELS stronger. Of course, we now know that it isn’t true and at best, it’s only feeding their ego. doesn’t guarantee you’ll actually DELIVER more force. 1) If knee-bending is so bad, why do we do it? Well, the point of bending the knee is to either help you drop down OR to help prepare your body to shoot upwards. Like a basketball player bending his knees before a jump shot. The thing is boxing, you don’t really need to go up and down. I mean there’s always going to be a tiny bit of up and down, but the ‘up and down’ that you do in boxing is more like what you do on the jump rope (which requires very little knee bending), rather than what you do in basketball (lots of knee bending). And so the problem is that many boxers bend their knees way too much. And once you’ve lowered yourself, you know have to spend energy to get yourself out of the bend before you can move again. It’s a huge waste of energy but sure…it’ll make you feel powerful…at least until your legs super tired not long after. 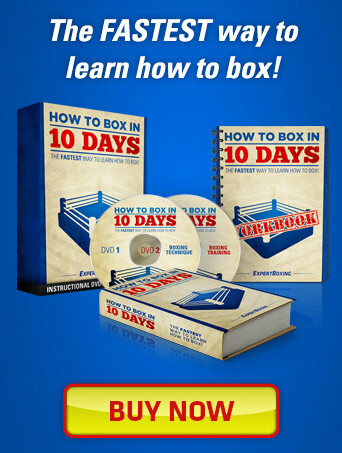 In boxing, all you really need are forward, backward, and sideways movements…up and down isn’t necessary. If you watch all the guys with the best footwork in boxing, they rarely bend their knees when they move around the ring. And they don’t make giant up and down movements. NOTE: I am aware of the flashy explosive guys moving their heads up and down or leaping in at times with what looks like a lot of up and down movement…but it’s not their hips and knees that do so much up and down, it’s their head movement that makes them look like that. I should also add clarify that using the knees is good for GOING DOWN quickly, but it’s not good for going up and down quickly. rarely bend their knees when they move around the ring. FURTHER NOTE: I am not saying that fighters should never bend their knees or that the good fighters never ever bend their knees. Please…do not take advice too literally. There are an infinite number of reasons why bending your knees could be a good idea in certain situations (such as when they roll under punches, or dig into the ground a little deeper for offensive purposes). The situations I’m referring to are the moments when many fighters bend their knees but don’t really have to. 2) But then WHY are the guys with less skillful footwork are bending their knees so often? …this brings us to our second distinction in Ali’s footwork versus the average fighter’s footwork. Generally speaking, many types of body movements in fighting such a punch, a slip, or a footwork maneuver, can be categorized as “pushing technique” or “pulling technique”. Some moves such as a jab can only be seen as a “pushing technique” because of the straight-direction nature of it’s form. But other moves such as a left hook can be done in a both a “pushing” manner as well as a “pulling” manner. But which is better…pushing or pulling? And why? And how? I like to think of all maneuvers that move in a straight direction as “pushing” moves. And all maneuvers that move in a circular direction as “pulling” moves. The simplest logic I could come up with is that: Straight moves typically exert force straight away from you…which means you can only push them out. And that circular moves have to be pulled in a centripetal manner from a grounded center point, because it’s kind of impossible to push in a circular manner without throwing/twisting yourself off balance. PUSHING technique is best for linear movements. PULLING technique is best for circular movements. So what does all this “pushing” and “pulling” have to do with footwork technique? Well, it has to do with the way you move your body. If you are always trying to push your way through movements such as in punching technique, that attitude will be reflected in your footwork and you will have a “PUSHING” type of footwork. 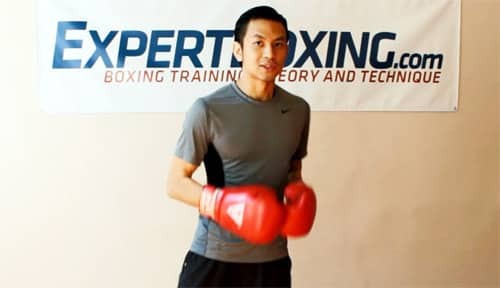 Whereas if you’re more accustomed to incorporating pulling techniques in your punches and other body movements, your footwork will also likely have more of a “PULLING” quality to it. So which is better? Pushing technique or Pulling technique? It depends. It’s tough for me to go out on a limb and generalize this for ALL movements. But for sure, pulling technique requires more skill than pushing technique. And that in situations where you can push AND pull, the pulling version will probably be the more powerful one. Pulling is technically harder (and possibly more physically exhausting) than pushing because you need to have more balance and axis awareness skills in order to pull. Imagine yourself swinging a bat versus swinging and leaning back against an Olympic hammer throw. Both are circular movements but with the bat, you just muscle through it whereas with the Olympic hammer throw, you have to be extremely mindful of your balance. With pushing, you can do it from anywhere, any position…you don’t have to have perfect balance. You are always ready to “push” at any moment. But with pulling, you’ll fall right away if you’re not precisely in position. Then again with pulling, you have the advantage of being able to use more body-weight effectively into the movement to generate more power. Pulling could also be seen as being more exhausting at times but that is because it gives you the ability to apply more power. Overall, pulling is easily more energy efficient technique than pushing technique. I think there’s also a connection between pulling technique and snapping technique. I find it far easier to have snapping punches when you visualize them as pulling technique (rather than pushing technique). It’s as though you’re pulling your hand back already except it’s passing through an outwards point where it strikes your opponent. Whereas if you visualize a punch as a pushing motion, you’ll have to generate 2 separate forces, one to send the punch out and the other to recover it. Utilizing pulling technique makes it easier to snap the punch because the pulling helps to circulate the momentum of that hand back to you. Pushing technique does have it’s advantages. It doesn’t require as much skill or perfect positioning. You could be in an off-balance position or weird position and still have some ability to push (although not very powerfully). It can allow for faster movements at times. It can allow for many more movements that cannot be done in a pulling manner and/or do not need the power generation of pulling technique (e.g. feints, trick moves). and energy-efficient than pushing technique. The biggest difference in pushing footwork vs pulling footwork, aside from the way it looks, is the difference in muscles used and the manner in which they are used. A fighter using “pushing footwork” is most likely going to bend his knees more because it loads up his muscles more and gives him the feeling of having more explosive potential. And once the fighter bends his knees, the force will go to his knee joint and quads. And that is what gives him the up and down aesthetic when he moves. Kind of hoppy, a bit like a frog or kangaroo. On the other side, you have the guys with the “pulling footwork” who stand with straight legs. Because they’re not pushing themselves around (which they can’t since their knees aren’t loaded up), they typically have a pulling or swinging effect to their movements. Instead of their body weight being loaded onto their knees and quad muscles and being pushed around, they have their body weight generally pretty high. Their body weight will be more in their hips (and even upper body). And their body forms a stronger line to the ground with the weight supported by the hips and feet rather than the knees. When you have a strong presence throughout your entire body, your upper body carries your weight higher, which then allows your to swing your legs underneath you easily. It’s kind of like when you walk, you feel the efficient momentum of swinging your legs underneath you because the leg is almost straight and your body is more upright. In boxing, the fighters stay high in order to do the same. Sometimes the legs are being swung in a linear fashion, other times in a more circular fashion. Now on the other hand, if you collapse your body weight into your knees too much, you will find that it’s easy to collapse your presence up top as well and the upper body caves in. In a sense, the axis in your upper body is now melted and makes it hard for you to move from one place to another. The muscles used by fighters with “pulling footwork” are usually the hip muscles, adductors, as well as the calves. And what you’ll typically get is a more consistent slight bounce with lots of swinging-pendulum type of maneuvers. They have more of a relaxed floaty bounce rather than an exhausting heavy-loaded bounce. Because their weight is higher up, it’s easy for them to swing their legs around…whereas the “pushers” have their weight so low that they have to keep lifting their center of gravity in order to be able to move. One funny thing to note is that many people think that the guys who bend their knees will get to use their calves more but this isn’t the case at all. Your calves work best when your knees are relatively straight. Once your knees are bent, you can’t really use your calves at all. You can try it right now and see for yourself. 🙂 Bend your knees and then see if you’re able to use your calves to elevate your hips away from the ground, while still keeping your knees at the same bent angle. more so than the quad muscles and knee joint. Another thing I’ve noticed with pulling footwork vs pushing footwork, is that the guys who pull tend to have more traction and connection with the ground. It’s interesting because even though they seem to be bouncing or jumping a lot, they still grip the ground and use it a lot to move themselves around. Whereas the “pushers” are using their legs to jump themselves off the ground and they seem to disconnect with the ground a lot when they move. You will find that the guys with the best footwork will move a lot. It’s because they’ve found a way for their body to move easily. It’s not because they love wasting energy or have so much cardio. 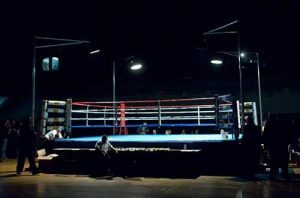 Their body is already naturally in motion and if anything, it takes more energy for them to stop and so it’s easier for them to keep floating around the ring. On the flip side, the fighters with inferior footwork ability will find it exhausting to move and so they don’t move much and every time that they do want to move, they have to generate a new energy for it. They never get to recycle the momentum from their last movement. This is the reason why they don’t move as much and yet, they still get as tired. You will know when you’ve found the right way to move your body when it’s effortless to move. It’s like jump-roping technique. You’ll know when you’re doing it right because you can last for hours on minimal effort. Fighting footwork technique is the same. and it takes more energy for them to stop. How do you train for “pulling footwork”? Unfortunately, most of the footwork training in boxing is inadequate for developing “pulling footwork” skills. This isn’t to say that all boxing footwork training is ineffective or that all boxers have terrible footwork skills. Not at all. My point is that the general knowledge and technical theory behind how boxers should be taught to move their body is lacking and perhaps even misunderstood. I almost wanted to say “primitive” but this wouldn’t make sense because I feel the guys in the old days moved better. A lot of the classic knowledge is lost and people nowadays are coming up with new ways of training that although provide new benefits, have not yet fully eclipsed all the benefits of the old methods just yet. Much of today’s athletes are left to their own talents. That is, many of the guys with the best footwork are able to move that way simply because they are talented or naturally move a certain way. It’s not because they were taught to move that way. And many of the guys that don’t have this natural footwork are not taught how to use their bodies in this more effective manner, and so they just live on assuming they will never develop that style of movement. the result of natural talent rather than structured training. What type of pulling footwork drills should you train? I wish I had names for the exercises that I do (and teach to my fighters) but they don’t exist in the boxing world. Nobody does them and there are no universal names for them. I’ve made a video training program for it but it isn’t free and so to help those who don’t have the money, I suggest these tips below. Something else you need to understand is how to really use the core. And how to really create a core presence. This is something is almost completely misunderstood in the fight world, and even personal trainer world. It’s hard to explain and even harder to understand. My simple advice to you is to work on developing a core awareness that allows you to hold a higher center of gravity without disconnecting from the ground. That’s my magical secret that I can give you today and I hope it leads you in the direction of finding that new level of balance & power. without a disconnecting from the ground. How long will it take to develop pulling footwork? Nobody’s actually asked me this question but I felt it was important to address this. As with all techniques, such as snapping punches, the more skillful the technique the longer it will take for you to develop the skill. 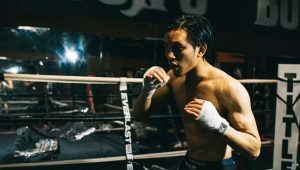 It’s important to mention this because many fighters will disregard a technique as being useless or ineffective simply because they do not yet know how to do it properly. Obviously, no technique will work if you cannot do it properly. Pulling footwork requires far more skill to use because you’re learning how to really use your body. How to find your balance, how to create natural momentum through your body weight, and how to do it all with minimal effort. It’s not as easy as simply having strong muscles and then contracting those muscles. You really have to understand how to move your body. Think of it as coordination skills, like a dance. Sure you can use muscle, but that alone won’t make it effective and graceful. The other part of developing pulling footwork is your body development. As I’ve said before, it takes more skills and awareness to utilize “pulling footwork”. And to further add upon that, you need a better designed body to use these skills…which is not something the average person is equipped with. The average person lacks not only an inadequately designed body for graceful footwork but also the wrong mindset to achieve it. You can see why this combination would make it difficult for you even if you did manage to get the technique right. If you wanted to design your body more for pulling/swinging movements rather than pushing movements, you would probably develop your body to be something more like a golf club rather than a spring. I would say many of today’s fighters are geared towards that pushing mentality and have trained their muscles to activate and fire in that way for so long that it will take them a while to be able to step out of that mindset and develop new coordinations for their muscles. And so back to how long it will take. My guess is about AT LEAST a year’s worth of training. Added on and/or subtituted in place of what you’re already doing. Every individual is different. It is because of this tremendous commitment that many fighters will never make the leap from “average footwork” to “great footwork”. Instead, the “average guys” will simply improve upon their pushing technique and leave it at that. And the “natural guys” will simply rely on their natural body aesthetic and talent rather than to really hone that ability. If you’re really serious about developing a better skillset for athletic footwork, check out my Dancer’s Footwork for Fighters. It’s really an incredible program packed full of drills I have never seen in fighter’s footwork training anywhere. I simply cannot truthfully recommend a better form of footwork training and balance awareness training that is developed for fighters, it has not yet existed in the boxing world in any standardized manner. Dancers do it best. If money is a problem or you think it’s just silly, well…I suggest you keep exploring and finding new ways to move. The ultimate lesson is to not bend your knees so much, try to swing more rather than push more. Amazing article, Johny ! Thank you very much! Definitely learned something from this. I’m trying to visualise the hips as hinges for my legs rather than my legs pushing me from place to place.. floating (like a butterfly) rather than hopping. As someone who has done a little dance training myself I can tell everyone who tries this… best of luck. You’re going to be shocked at… well, first, how tight your hips and pelvis actually are which your leg muscles have been compensating for. Then you’ll be shocked at how hard it actually is to do. But as your hips loosen up, you’ll be pleasantly surprised at how much more mobile you become. 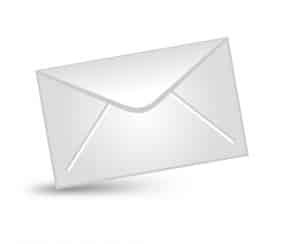 Great article, I’m amazed you do this all for free! I’m 15 and I want to start boxing. I’ve been doing karate for about 2 months but I don’t think it’s for me. However, I love the punches they teach us so I’ve gravitated towards boxing. I’m fairly light and I don’t have any real experience with boxing. I *think* I can throw a jab and a cross, but I haven’t really got any place local I can go to try them out (there appear to be no boxing gyms near where I live). What would you suggest? I write out of love for the sport! I suggest for you to go to any gyms that you can…whether they be MMA or kickboxing, Muay thai, etc. If there are really no martial arts schools or any other option, you’ll just have to move elsewhere. I’m impressed already with John’s explanation; i’ll be watching more. Hello, Johnny. I’m going to have my first amateur match next month and I’m having troble against the turtle shell, my sparring partner always turtle up and get close then he throws a lot of hooks and uppercuts, it’s annoying and I don’t like being up close, so can you give me some advice on how to break through the turtle shell defense and some counters for the hooks and upper in close range? Very good article really enjoy the videos as well everything on your site is excellent a great resource. Thank you. sir.. can u write an article on exercise for developing lightning fast footwork?? What kind of boxing background do you have.Is this technique of yours contrary to current boxing training methods.Do you currently train any succesfull fighters. I learned boxing in a gym, with boxing coaches. I teach pretty much 95% the same as everyone else and then share a few things that go against the rules. I do not train pros, it’s mostly random people wanting to learn how to box, and at best I get to work with a couple guys with a couple amateur fights. I corner guys or work mitts or help them with form when they need. I try to avoid being the main trainer as much as possible nowadays. It’s very time-consuming.